Testa was born in 1923. He found his way to architecture via naval and civil engineering. 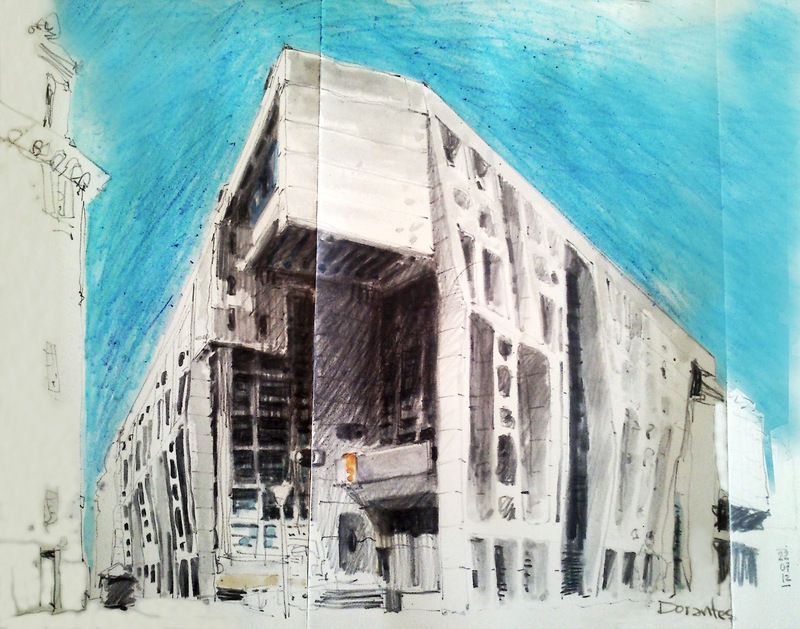 A two-year trip to Europe allowed him to familiarise himself with modernism and his big icon Le Corbusier. He also was an avid painter. 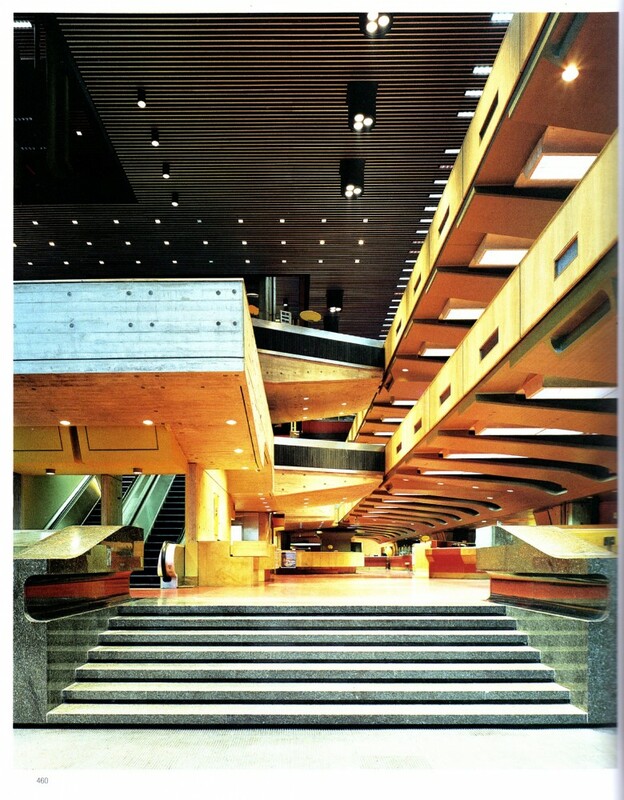 Perhaps this gave his modernist and Brutalist buildings their signature light, almost sculptural qualities. 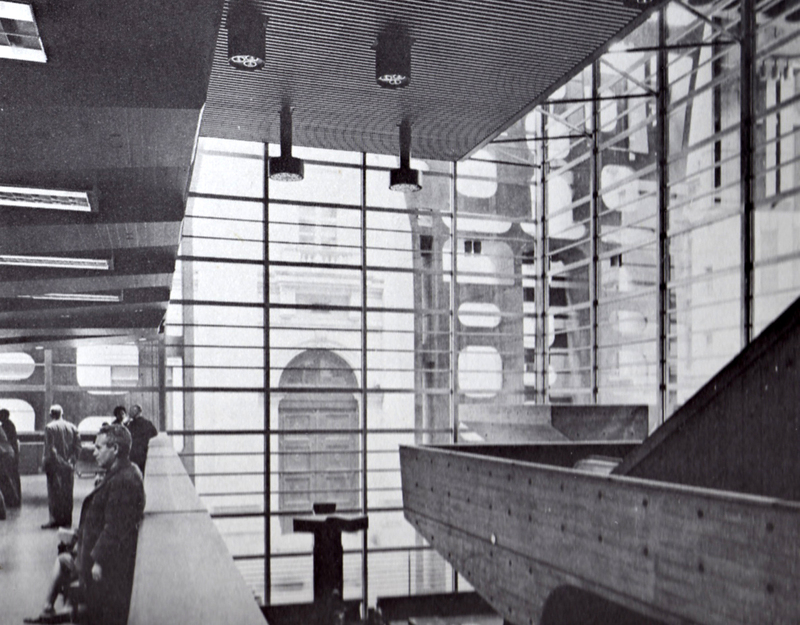 Although Testa had won the design competition in 1959 already, the Banco de Londres building was completed in 1966. It served as the headquarters for the Bank of London and South America (BOLSA), back then one of the major banks in the region and later swallowed by Lloyds. 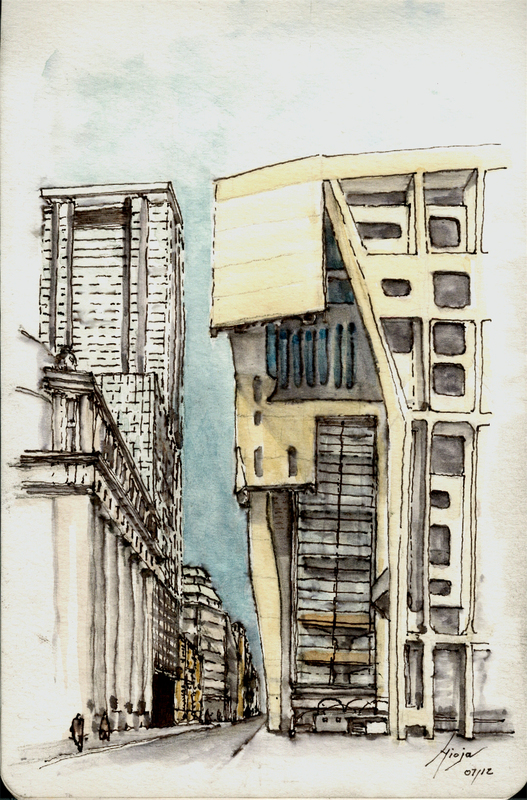 It is difficult for the amateur to take good pictures of the building given its narrow environment on Reconquista in Buenos Aires’s San Nicolas neighbourhood. 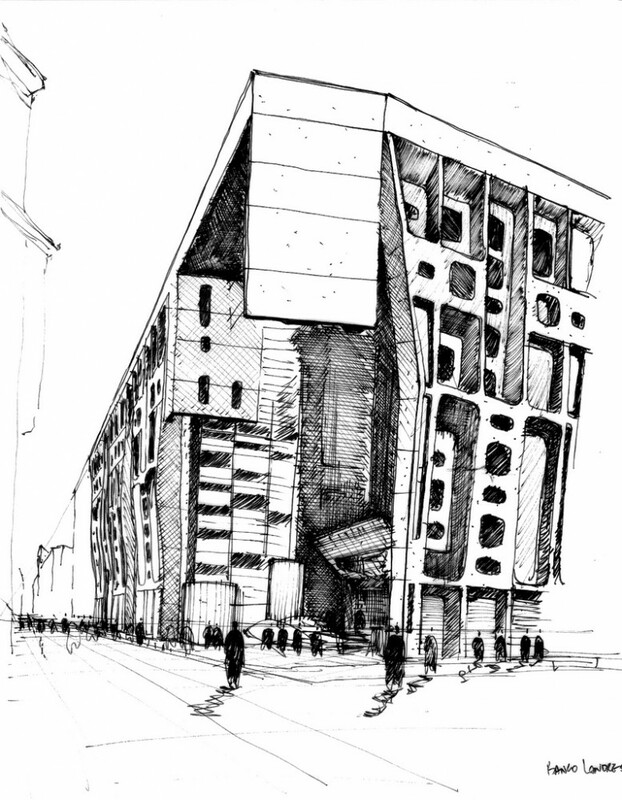 Sketches may better capture the essence of the building, e.g. here, here or here. Among the features that are hard to convey is how well the building fits with its neighbours (a photograph from 1967 on Flickr here) by adhering to the same height as well as overall proportions. The concrete brut being used has also aged remarkably well. The open space the building creates in its narrow street environment is all the more special. This is a Brutalist building that does not intimidate but has plenty of grace. Unlike so many proponents of its style, it does not feel like an alien invader but takes its context into account. Unfortunately I wasn’t able to look around inside the building as we arrived after opening hours. Again Google provides the missing images, e.g. here, here or here. The space appear open and light. Growing up in the fervent atmosphere of Buenos Aires in the first half of last century, Testa is arguably one of the last representatives of an Argentinian identity and energy now sadly waning. This is metaphorically embodied in the chronology of the National Library, a building conceived during the thriving and intellectually sophisticated Buenos Aires of the ’60s, which was then forced to remain in a sinister limbo during the successive military dictatorships of the ’70s. Yet the democracy of the ’80s failed to rescue it and the Library had to wait until the ’90s to be officially opened; paradoxically, under the neoliberal government of Carlos Menem, a period that ushered in a tragic decline in the country’s cultural aspirations. Despite its dimensions, the visual impact of the library is rather subdued. One approaches it through a small stretch of park, off the main road. The quadratic form and the elevation on stilts make this a more typical proponent of Brutalism. It was strange to learn that it was only finished and opened to the public in the early 1990s, by when the style had mostly vanished around the world. Again we were unlucky and couldn’t enter the building. The city views from the top floor reading room are allegedly very good. One of Testa’s later buildings is this house by the sea in Buenos Aires province. This entry was posted in Architecture, Argentina by benbansal. Bookmark the permalink.